Days out in the capital with children are magical. But with a whole family in tow the cost can soon rack up. If you're planning a holiday or day trip on a budget, we recommend you ditch the supermarket sandwiches and mediocre café fare, for these options instead. 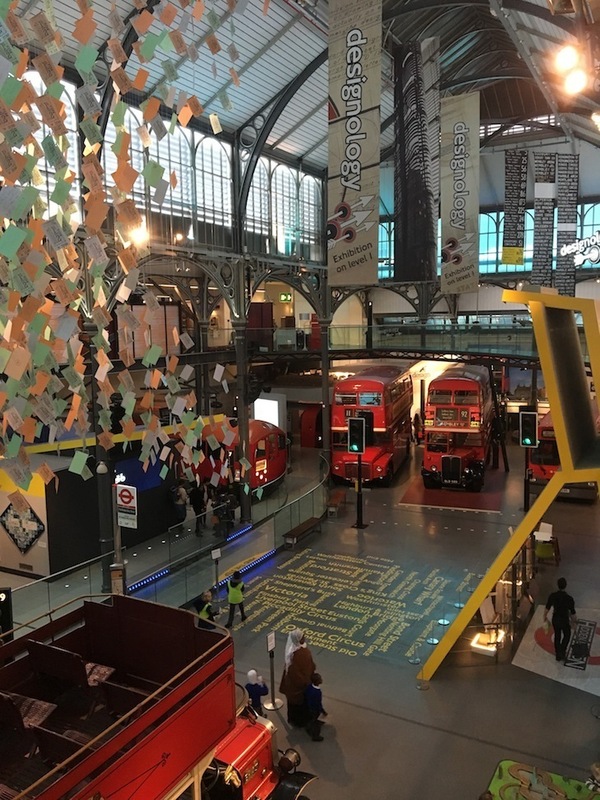 A short stroll from the London Transport Museum, half way up Drury Lane, is this unique, spacious café serving sustainably and ethically sourced food to eat in or take away. For lunch, choose from a buffet selection of mains and side dishes, such as lamb meatballs, slow cooked beef brisket, roasted sweet potato with ginger and buckwheat tabbouleh, to create a meal to suit individual tastes (£7.50). At around £3, the soup specials are great value too for smaller appetites. And with free still and sparkling water, there's no paying for overpriced bottled stuff. It's a good pit stop with prams or buggies as there is plenty of space and good-sized toilets downstairs. 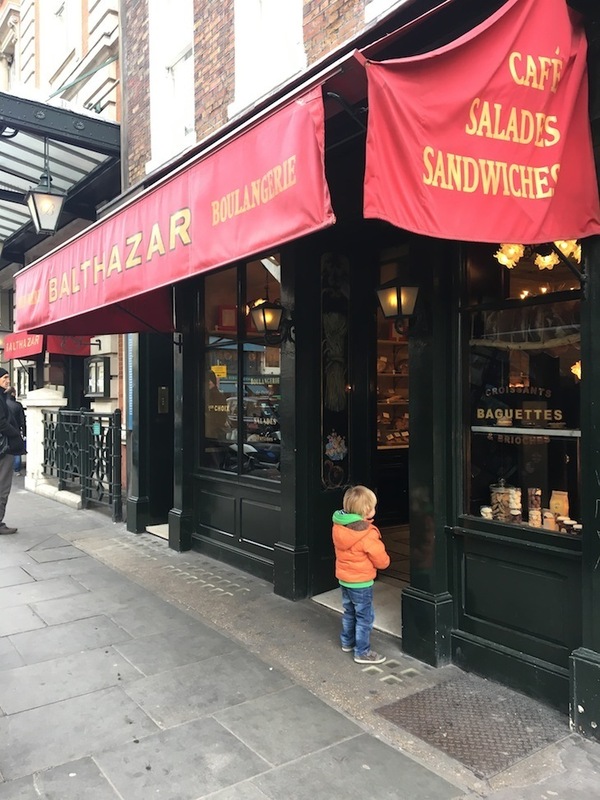 If your children are at the 'can't sit still for five minutes let alone for a whole meal' stage (we've all been there), then pick up sandwiches and cakes at Balthazar Boulangerie to take into the museum with you or eat while watching the street performers in Covent Garden. The sandwiches start at about £5 to take away — good value given the quality of the bread (freshly baked in house) and the area. We go for the brioche bun packed with smoked salmon and celeriac remoulade every time, but the salad boxes are also popular. If you're looking for a sweet treat to round off your lunch, then the apricot kouign-amann is big enough to share between two (or you could just treat yourself to one to enjoy whilst the children are busy playing in the museum). Padella, from the duo behind Trullo, opened in spring 2016 to daily queues around the block for its freshly made pasta, and is our top pick for cheap eats in this area. The menu is short with a handful of starters, six or seven different pasta dishes and a pudding or two... but the pasta is the main act and the best value. Yes you may have to queue, but if you make your way there a little before noon or 5pm (both of which are often the times we hear the cries "I'm hungry") then you should be fine. With prices starting at around £5.50 for a plate of hand rolled pasta, it's an affordable option. 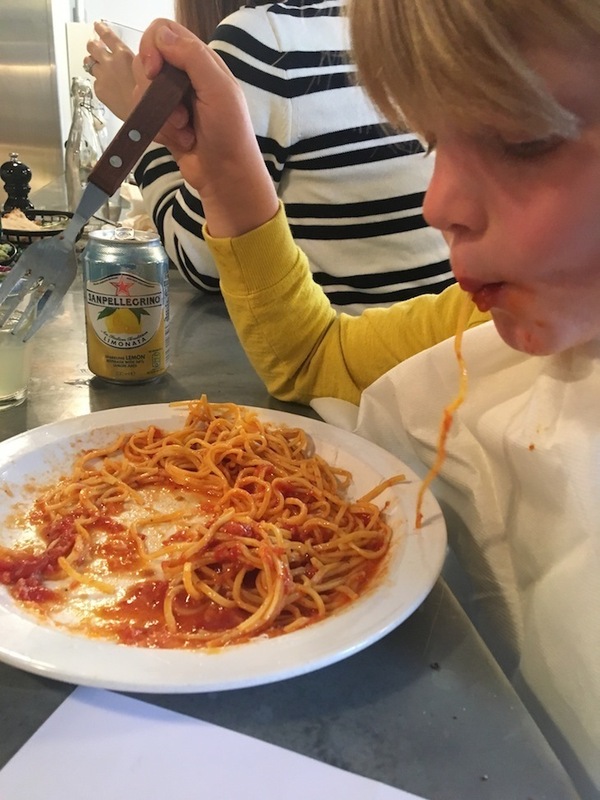 Although the portions aren't huge, they're perfect for lunchtime and the tagliarini with slow cooked tomato sauce is easily big enough for two small children to share. Not only do they serve one of the best cheese toasties in the whole of London, Kappacasein also make the cheese that goes into the toasties. 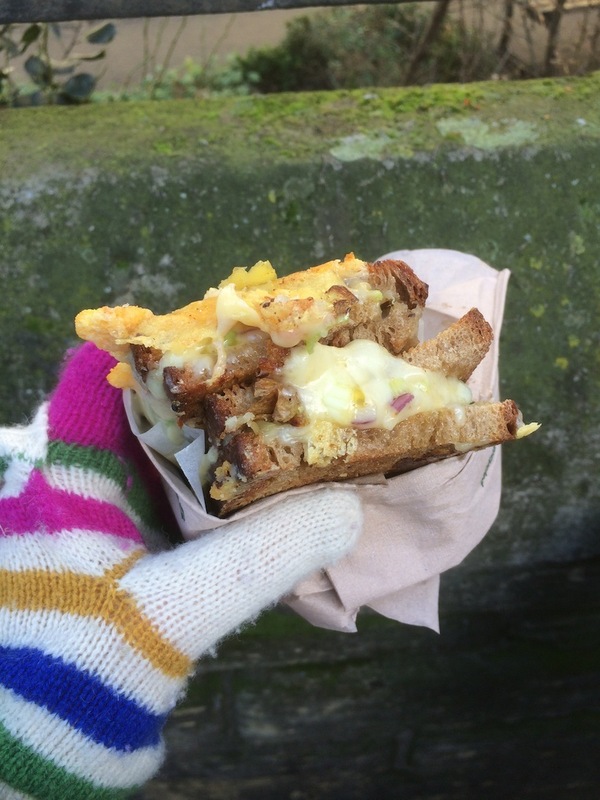 With a mixture of melted Montgomery Cheddar, Ogleshield and Comté, with onions and leeks sandwiched between two slices of top notch toasted polaîne, this one should be top of your list if you’re grabbing a bite to eat on the go. At just £5 a piece, you might even be able to stretch the budget to a doughnut from the Bread Ahead Bakery stall for dessert. As an area known more for its expensive shops and fine dining, Marylebone isn't the easiest place to find quality food that's also affordable. However, The Golden Hind, which has been serving fish and chips for over 100 years, dispels the myth that you can't get decent fish and chips in London. Fresh fish is delivered here daily from Grimsby, and you can get battered cod & chips for under £10 at lunchtime. Set away from the hustle and bustle of Marylebone High Street, Nordic Bakery, with its clean lines and slick design, serves up a long menu of Scandinavian inspired sandwiches and quiches starting at £4. Go for the brie and lingonberry on dark rye and save room for one of their rustic Finnish cinnamon buns. 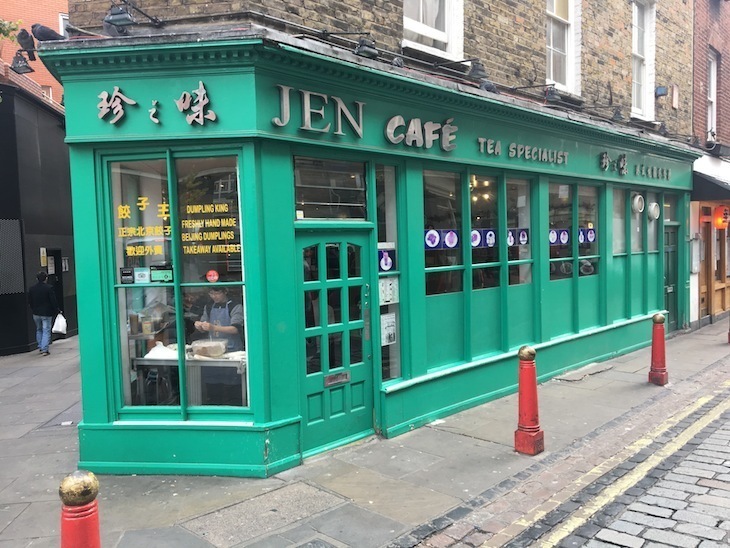 A short walk from Trafalgar Square and Covent Garden, this Chinatown institution is the place to go for Beijing dumplings. Freshly made by hand every day, what they may lack in elegance, they more than make up for in flavour. 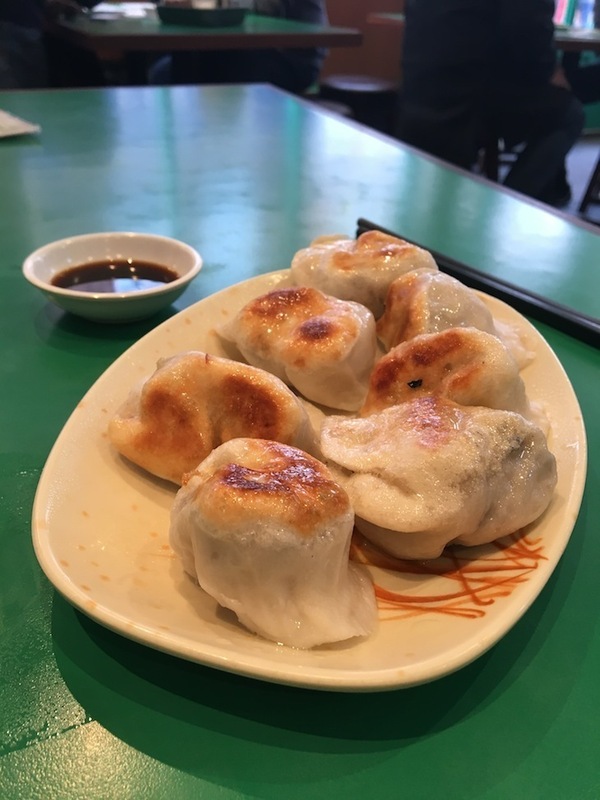 We love the vegetarian jianjiao or fried dumplings (£6 for eight pieces) but you can also order boiled dumplings (£5 for eight pieces). It is a popular spot at lunchtime and the big green, formica topped tables are big enough to share when it gets busy. There are forks for children who haven't mastered the art of chopsticks yet and plenty of drinks to choose from (but the toilets have a habit of being out of order which you might want to bear in mind with small children in tow). At £6.75 the Sourdough Magherita at Pizza Pilgrims is hard to beat. These Neapolitan style pizzas — sourdough bases topped with fior de latte mozzarella and San Marzano tomatoes — are the product of a pilgrimage around Italy by brothers James and Thom. 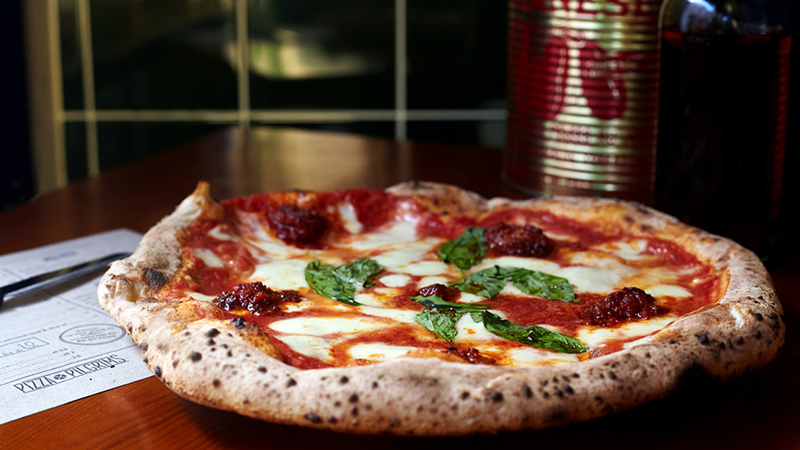 They've come a long way from their early days of just selling pizzas out of the back of their converted Piaggio Ape van on Berwick Street market in Soho, and this branch of the popular, family friendly pizzeria is their fifth foray into bricks and mortar. The simple menu makes Honest Burger a good spot to grab a quick bite to eat when the 'hangry' stage has kicked in and patience is wearing a little thin. Choose from chicken, beef or veggie burgers, all served with Honest Burger's signature rosemary salted chips (starting at £7.50 for the veggie burger and going up to £12.50 for the special). What we love about the children's menu here is that it offers exactly the same food as the standard menu, just in smaller portions, for half the price. Pizza Pilgrims make some of the best pizzas in town. What started out as a small market restaurant selling sourdough pizza to the people of Brixton, is now quite an operation, with 28 restaurants across London and the south east. Whilst the quality of the pizzas (and the service) can vary between locations, you can't deny that they serve up tasty pizzas, made from quality ingredients. The best bit is that all of the pizzas on their menu are under £7 and the 'number 1' with no cheese (loved by all children who have developed a dislike for melted cheese) is just £4.50.